Long Business Description: The UK’s leading integrated care management software, including care scheduling, electronic care plans, eMAR, finance, payroll and recruitment, accessible on any device including mobiles and tablets, with offline functionality. Over 1,400 care homes and 1,200 homecare branches use Access Group software, including 25% of all those rated Outstanding by the CQC, making us the true market-leading provider of social care software. Our clients range from single branches/care homes to national franchise networks, including Right at Home, Home Instead and HC One. All our clients use our integrated care management software to enable them to deliver care with greater safety, quality evidence and efficiency. Long Business Description: Karma Mobility has an extensive range of lightweight aluminium wheelchairs which include some of the lightest wheelchairs on the market and as they do not make wheelchairs for anyone else the designs are unique and often patented. Karma also offers an expanding range of powered wheelchairs including the Ergo Traveller, a lightweight, compact and highly manoeuvrable powerchair that incorporates the patented ‘S-Ergo’ seating system. The Ergo Traveller has been designed for indoor and outdoor use as it is compact enough to fit though most internal doorways and be stored away when not in use yet robust enough to withstand the outdoors. 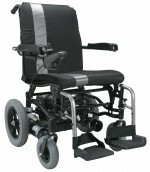 The unique design of the Ergo Traveller means it can be easily dis-assembled into 4 manageable components with the heaviest weighing only 24kg making it the ideal powerchair for users that often travel by car. Additional features include: a quick release battery pack that allows the battery to be recharged away from the powerchair, right or left hand joystick controls, height adjustable and flip back arm rest, adjustable backrest angle and height adjustable footplates. An optional attendant control can also be fitted to allow the carer to control the powerchair if necessary. Supplying the NHS and numerous mobility retailers throughout the UK with its high quality wheelchairs, Karma Mobility ensures that the outstanding design of every product is extensively tested and evaluated before being placed on the market. All Karma products therefore stand the test of time and prove to be an excellent long term investment. For more information or to find out your nearest Karma Mobility retailer visit: www.karmamobility.co.uk/where-to-buy or call 0845 630 3436. Long Business Description: The Mobility Furniture Company has over 30 years of experience in providing custom-made, bespoke furniture which are all hand-crafted in the UK. What makes them stand out from the rest is that they don't just offer you any standard model. They specialise in bringing the luxury of comfortable, stylish, made-to-measure furniture, offering quality rise and recline chairs, matching settees, fixed chairs and adjustable beds. Committed to maintaining their reputation in providing the highest-quality of custom-made furniture, the company does everything in their power to make sure that every customer is delighted and satisfied with the products and services they offer. In light of this, they have established a Customer Charter where clients take the first step towards buying their products, especially at a time when everyone is looking for full value for each pound they spend. This is where The Mobility Furniture Company offers the reassurance that they are proud to help their customers improve their way of life and that every piece of furniture they offer is British to the core. The Mobility Furniture Company endeavours to treat every customer with the same respect and attention to their needs and lets them be in charge of every step of the way. They offer free home demonstrations so you can test out the products in a much-relaxed atmosphere and even have a friend or relative with you to help you make the right choice. This way, you are also provided with the opportunity to ask any questions you may have. This means that everyone can be reassured that the company have friendly advisers who will be there with the sole purpose of helping the customers find what they’re looking for and there will be no high-pressure selling. In addition to this, The Mobility Furniture Company also offers a 68-page brochure for free so that you can browse through their complete product range at your leisure. If you'd like to request for the 68-page free brochure, get in touch with them on 0800 810 8816 or visit their website at https://mobilityfurniture.co.uk/ for more information. Long Business Description: Win Health Medical Ltd is a trusted supplier of medical equipment to the NHS, private health providers, care homes and general public. We specialise in elderly care products, designed to reduce fall-related fractures and injuries. Our leading products – HeadSaver Head Protector and HipSaver Hip Protectors are considered to be the best available. Our vast range of medical equipment includes continence care products, eye care products, pain relief therapy devices, health monitors and much more. We provide high quality products at affordable prices with excellent customer service and speedy deliveries. HeadSaver is a soft head protector designed to protect the head and the scalp from fall related injuries, such as cuts, lacerations, painful bumps and bruises. HeadSaver Soft Head Protector protects people at risk of falling and people suffering with medical conditions that make them unsteady on their feet (i.e. epilepsy, cerebral palsy or Parkinson’s disease). Designed to protect frail elderly people from fall related hip injuries and hip fractures, HipSavers are a leading brand of soft hip protectors used by the NHS since 2002, HipSavers are effective and user friendly and equally acceptable to the elderly people and the carers. DermaSaver Skin Protectors protect fragile skin from damage caused by friction, rubbing, shear and external pressure, preventing skin breakdowns, abrasions, tears, lacerations, splits and unsightly bruising. DermaSavers are breathable, soft and comfortable for night and day wear. Snug Positioning Pillows are uniquely shaped cushions designed to secure stable and comfortable body positioning in bed or armchair. Intended to improve quality of life of bedridden people. Snug Pillows redistribute pressure around the body, reducing the risk of pressure ulcers and painful sores.